1. Put the rice in a sieve and run cold water through it until the water is clear. Drain well, put in a saucepan and add 330ml boiling water. Cover and simmer gently for 8 minutes, then take off the heat and leave to stand covered for 15 minutes. 2. Mix the sushi-si and sesame oil together and pour over the hot rice. Transfer the rice to a shallow dish and turn it over with a spatula so it cools quickly. 3. When the rice is cold, put a nori sheet on to a sushi mat with the long sides top and bottom and spread an even layer of rice across the central two-thirds. Arrange a thin layer of filling down the centre of the rice and roll up with the help of the mat, tucking the uncovered part of the nori inside and dampening the final edge to stick it down. Cut the roll into 6 pieces with a damp knife. 4. 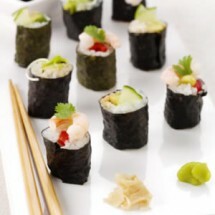 Make other rolls in the same way using the remaining ingredients. Serve with wasabi, soy sauce and pickled ginger.